NDACT is an incorporated, not for profit, entity which was formed in January 2009 by concerned citizens, including a number of farmers from Melancthon and Mulmur Townships. NDACT was formed when members of the community gathered to voice their concerns about The Highland Companies plans to build a 2,316 acre “Mega‑Quarry” on more than 6,000 acres of prime agricultural land that they had amassed as of that date. Concerned about the future of the croplands and water resources in the community and province wide, residents gathered together to rally opposition to the project. Our relationship with NDACT goes back to 2011. Iler Campbell provided NDACT with legal advice and assistance in their fight to stop the Mega‑Quarry and protect farmland and water in Ontario. Client Profile: Mondragon Co-operative Homes Inc.
Mondragon Co-operative Homes Inc. is a housing co-operative located in Brampton, Ontario which has been providing affordable housing since 1983. Mondragon consists of seventy eight townhouse units ranging in size from one to four bedroom units in a beautifully landscaped neighbourhood complete with a park and community room. 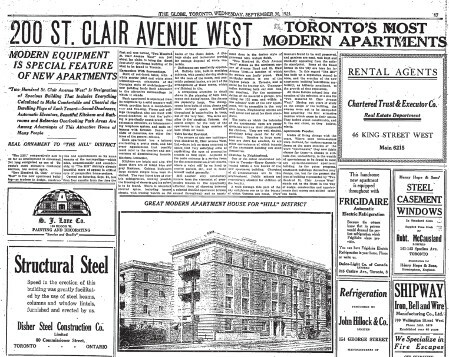 Client Profile: Amsterdam Square Apartments Inc.
A full page ad in the Globe for “Toronto’s most modern apartments” — September 30, 1925. Click to view the full page (pdf). Amsterdam Square Apartments Inc. (ASAI) was founded in 1984 by the tenants who occupied the stately but somewhat neglected building on St. Clair Ave. West in Toronto, adjacent to Amsterdam Square Parkette on Avenue Road. The building had been erected in an astonishing four months in the summer of 1925: the permit had been issued in early June, and the building was almost fully occupied by the end of September the same year. It was advertised in the Globe newspaper as “Toronto’s Most Modern Apartments,” boasting central refrigeration, automatic elevators, and a valet who was to “make himself useful generally.” It was operated as a rental apartment building for six decades. Caribana™, Toronto’s famous celebration of Caribbean culture, started in 1967 as a one-off event in honour of Canada’s centennial — “a West Indian salute to the people of Metropolitan Toronto,” in the words of founding chairman Samuel Cole. The week-long festival proved so popular that Toronto Mayor William Dennison urged organizers to make Caribana™ an annual event. In the decades that followed, Caribana™ has become the largest festival in Canada. That first parade attracted some 50,000 people. By 1990, Caribana™ had grown to host over a million revellers a year, with people travelling from around the world to attend and contributions to the economy reaching hundreds of millions of dollars. The Ontario Organizational Development Program (OODP) was established in 1995 as a government response to requests from AIDS service organizations (ASOs) and programs for long-term organizational development resources. OODP’s mission is to strengthen the capacity of HIV/AIDS organizations and programs in Ontario to determine their direction with awareness and to foster a culture within HIV/AIDS organizations and programs in Ontario to take responsibility for their own organizational development. They provide consulting services as well as online resources in service of this goal. The Regent Park Film Festival is Toronto’s ONLY free, multi-cultural, film festival. The Festival is dedicated to bringing high quality independent films to people from all walks of life, with a focus on folks from low-income and public housing communities. The Regent Park Film Festival promotes arts education through film and video for all ages, but particularly for young people – bringing them stories from around the world to learn from and grow.